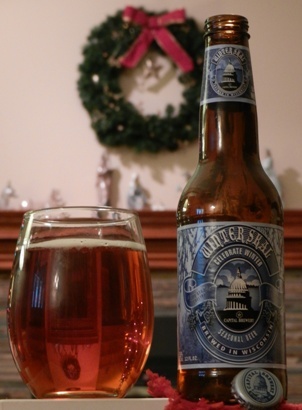 The winter offering from Capital Brewery in Middleton, Wisconsin is called Winter Skål. The name is a reference to the the Scandinavian toasting word skål, roughly the equivalent of cheers or prosit. I’m imagining a horde of vikings singing merry songs while warming themselves with mugs of mead. The Skål pours a lightly ruby-tinted gamboge color, and almost perfectly clear. There is just a bit of off-white head. A rich spicy and malty nose greets you immediately. Cinnamon and cloves are joined by well done toast and the aroma of something caramelizing. A bit of an earthy hop nose is present, and a bit of sulfur slightly impinges. The “lagery” sulfuric character comes out more on the tongue, somewhat obstructing the malt flavor. Clove spice and some roast malt flavor are present, and an herbal, earthy hop taste comes through as well. The body is quite full, which seems out of place given the other qualities of this beer. Overall the Skål is not bad, but I think it could use a little more time in the lager tank to clean up.